34% COC return & 12% CAP - Too good to be true? ForumsArrowReal Estate Deal Analysis and AdviceArrow34% COC return & 12% CAP - Too good to be true? The property is a 4BR cabin at the edge of the Great Smoky Mountains - a popular tourist vacation destination in Tennessee. Property values are rising around 6% a year in this area, which is friendly to STR's with no regulation, no plans for it, and a well-established history of private STR's. I will self-manage it which will be a PITA but worth it for the money. 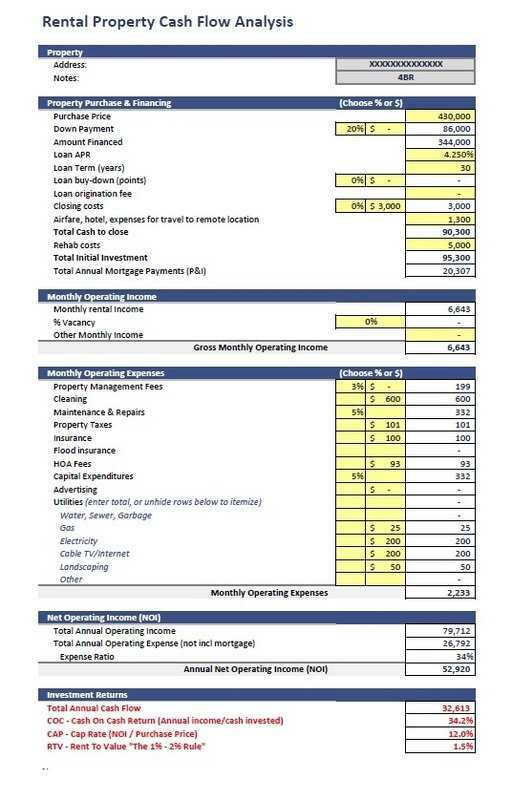 Annual expenses of $27k plus $20k annual mortgage pmts = $32k net profit per year. (This assumes 5% cap-ex, 5% repairs, 3% AirBNB/VRBO fees, plus typical taxes, insurance, and utilities). That's a COC of 34% and a CAP rate of 12%!!! So, please tell me what am I missing, or should I jump on this? With short term rental you’re going to have cleaning costs, and consumables, that will cost money, plus things like Internet and tv (depending on what type of area). So idk if it’s a good deal or not but I’m guessing your return numbers would be lower than this. Yes, it's a just cabin but it's a 2,700 sq ft one with 4 bedrooms, 5 baths, and a gameroom with pool table, video games, and a spa with an amazing mountain view. Cleaning, Internet, and TV are all included in the spreadsheet above. I believe it will appraise. Another just like it sold for $435k 4 days ago. real quick, you have PM @3%, 0 for advertising, 0 for water/sewer/ garbage, and only 5% for repair and 5% cap ex. I know it's STR so maybe 5% for repairs and cap ex is ok, idk. But unless it's oon well, outhouse, and burn pit; I imagine W/S/G will need to be paid. also how to you plan on keeping the 6k/Mon in income with 0 advertising? Awesome questions - Water is by well, sewer is septic, garbage is collected by the cleaners who clean in-between guests. Advertising is via AirBNB and/or VRBO which is where the 3% PM comes from. I suppose I could increase repairs from 5% to 10% to cover worst-case septic/well maintenance, but that only drops the net profit from $32k to $29k and the COC from 34% to 30%. Still looks amazing to my newbie eyes. @Tim Schroeder id ask for last two years of income if possible and see if it’s the same or better. I’m not sure how likely it would be to repeat that each year. What was the occupancy rate last year ? @Caleb Heimsoth regarding Cap rate, I totally agree. What I care about is income and getting the best COC return and 30-34% is phenomenal. And if it doesn't appraise well, that's not the end of the world. I forgot to mention that AirDNA (They sell data analytics for AirBNB cities) rates it "A"
@Tim Schroeder I have 5 and I’m very happy with my numbers! Don’t over think it just dive in. You’ll be on to your next one before you know it. It’s not such a PITA I do 5 with a day job. Working on a 6th!